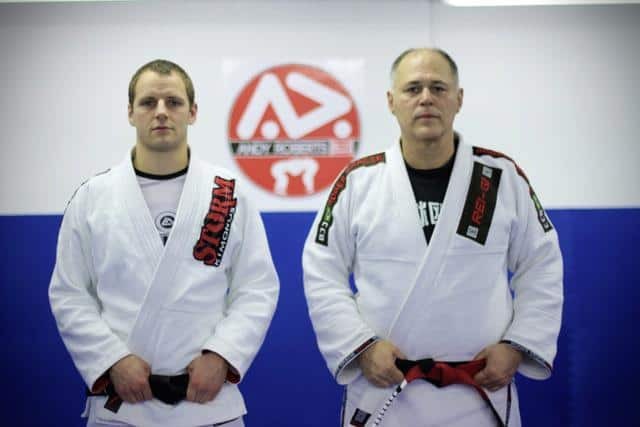 If you’ve done BJJ for a few years in the UK, then Andy Roberts is a man who’s always been talked about. Andy is a respected instructor in the UK and he is also a Black Belt under Roger Gracie, so you know he’s got good credentials. Thank you Andy for doing this great interview. Here it is. Well, I did my first seminar in ’98/’99 and drilled that but i count my ‘official’ start as May 2000, when I went to the Gracie Academy in Torrance. I was promoted to Black Belt on 5th March 2011 by Roger Gracie. I was already training Martial Arts (my parents put me into Judo to stop me getting bullied), I had done Judo then moved onto Japanese Ju Jitsu (which I hold a 2nd dan in) in ’93 or early ’94 me and my friend convinced his mum to get UFC1 out of the video shop, we watched it, we watched the Jiu Jitsu fighter beat everyone so i continued with the Japanese ju jitsu. I then got the opportunity to go on a Carley Gracie seminar in ’98 and then realised what Jiu Jitsu really was and was hooked ever since. It’s amazing, it has its pitfalls but for the main it’s awesome. I think Jiu Jitsu is for everyone and anyone who trains sees the benefits it has and should encourage others to train. Imagine what the world would be like if everyone trained Jiu Jitsu!! Honestly, I dont really like watching a lot of Jiu Jitsu matches but I like watching Roger, Braulio and Lagarto compete. To win!! I have a lot of stuff going on in my life in 2014 but I aim to be fighting a few domestic comps and maybe 1 or 2 european ones. As well as trying to spread the art and grow my academy I am also putting on a tournament, which I hope to set a standard of excellence with. Competitor experience is my priority with it. Dont give up! it’s a cliche but it’s true, the only path to success is hard work and mat time, there are no shortcuts. There will be times when you are getting smashed, times when you are smashing others, times when you feel on top of the world and times you want to quit, what you choose to do in these situations is a reflection of you and how you handle everyday situations. DONT QUIT and the rewards will come. Promote myself? Yeah, i’ll have a couple of degrees on my belt please (thats a whole other interview)! I’d like to pimp out my academy andyrobertsbjj.com, everyone is welcome to come and train if they are in the area, you don’t need to wear a plain gi, take patches off etc, just come to learn and have fun with a good attitude. I would like to invite everyone to compete at the Surrey Open, www.surreyopen.co.uk I promise it wont disappoint and thanks you to Storm Kimonos for their continued support and made4fighters.com for helping with the Surrey Open (Discount code for Made4fighters.com if yousign up for Surrey Open!! ).